This article started when I investigated what the various stamps on a playfield mean. 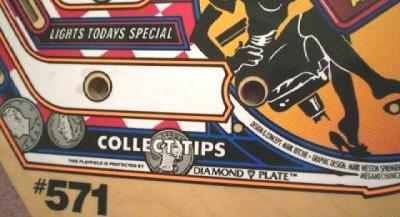 If you have ever cleaned a pinball playfield or looked closely at a playfield, you probably have noticed that most Bally / Williams playfields have letters and dates stamped into them on the edge. If you look closely at several pinball machines you will also see the cabinets have identifications on them. Digging deeper into the subject and searching into the history of companies involved, the scope of this article became much bigger. Now it documents about every company that was involved with the creation of pinball art, cabinets, playfields and backglasses. Because so much information is contained here this article is split up over two pages. 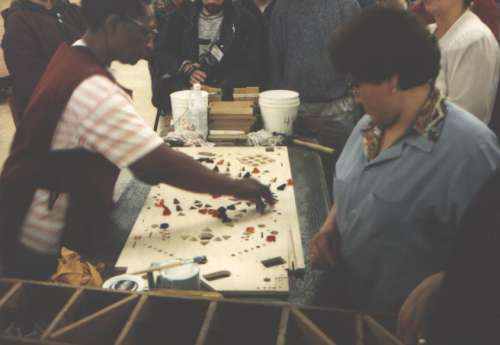 This page talks about manufacturing pinball playfields. Page 2 is about manufacturing pinball cabinets and backglasses. My Road Show: ESC NOV 02 and SP NOV 17 1994. Most of this paragraph comes out of the book Pinball Art by Keith Temple. If you are interested in the subject I strongly suggest you try to find a copy of this book (they sometimes show up on ebay). It goes into detail about the different artists and companies involved and even has photographs from inside the companies involved. Pinball companies used subcontractors from the very beginning. It is said that Raymond Moloney himself, the founder of Bally Corporation, contacted the company Advertising Posters to ask if they could screenprint directly onto glass. They could, and the backglass as we know it for many years was born. Before that time backglasses had artwork which was applied using water-transfer decals. Designing the artwork for a complete pinball machine was also subcontracted. A pinball company would only make a whitewood game with a specific layout, and artwork would be made afterwards. Up to the 1970ies (when licensed games became more popular) this was still the way pinball companies worked. Silverball Mania and Mystic for example were just a playfield layout for which the artwork and theme was designed later. Only during the 1980ies when games became more complicated and had specific modes in their gameplay, theme and artwork became more involved. It totally changed they way pinball machines were designed, every department was not a separate entity on its own anymore. From the start of the design process for a new pinball machine, the whole pinball design team including the artist and game designer had to work closely together. In the very beginning of pinball and 'flipper games' there were 2 companies involved: Reproduction Company and Advertising Posters. Advertising Posters was formed in 1932 by Thomas Grant (an advertising artist) and John Van Ansdale (a pinball engineer). Together the companies made the artwork for almost every pinball machine produced in the USA. It was even so that at both companies, usually only one person was responsible for a pinball client. Famous artist Roy Parker made the artwork for every Gottlieb pinball machine created until the mid sixties. Somewhere in the late 1950ies there was a series of fires at Reproduction, which destroyed all their screens and equipment. This fire caused them to loose the Gottlieb contract (including Roy Parker) to Advertising Posters. In the next period 99 percent of all artwork on pinball machines was made by Ad Posters. Only later (in the 1970ies) pinball companies like Bally started their own internal art departments, but most companies still outsourced production itself of backglasses, plastics and playfields. What do the letters on my playfield mean ? It is important to know that most pinball companies did not make playfields and cabinets in house. The production of playfields was subcontracted to other companies. So the letters identify what company has worked on the playfield. It's that simple. Because there are several steps involved in making a playfield and not every company could create a playfield from start to finish, playfields were sometimes shipped from one company to the other. That explains why you find multiple stamps. Light inserts being added to a Johnny Mnemonic playfield at Lenc-Smith. Game designers did not know in advance what company would handle a playfield, this was decided later in the production process by the purchasing department. So for every game it could be different or even change during the production run. Churchill Cabinet Company exists since 1904. Since about 30 years they produce cabinets for the coin-op industry. Churchill made a lot of cabinets and playfields for Williams in the past. Of all the companies mentioned in the article, they're the only one that still supply pinball machine parts as they make the cabinets and playfields for Stern Pinball. Their sister-company Chicago Gaming Company even makes complete games like the Vacation America pinball machine and the Arcade Legends video game. Electronic Sound was a contractor for multiple pinball companies. They made parts for Williams (display panels and playfields). Mosty dmd display panels on WPC machines I have seen have been made by ESC. Further it has been confirmed to me that Premier / Gottlieb used Electronic Sound as contractor for all their playfields and cabinets between 1984 (and probably long before) until they stopped making pinball machines in 1996. Premier was one of the major customers for Electronic Sound. It looks like the end of Gottlieb pinball machines in 1996 also meant the end for Electronic Sound, as now Chicago Gaming Cabinets is registered at the same address ESC used to be. I've been recently contacted by Larry Rosenzweig, who was president of Electronic Sound Corp. More information about this company can be found in this article. The Lenc-Smith company existed already since the 1960ies and had been acquired by Bally Gaming at the end of the 1960ies. Probably every Bally cabinet and playfield since around 1968 was made by them. In 1988 Bally sold their pinball division, including Lenc-Smith, to WMS Industries. Bally had diversified its operations into Bally slot machines and even Bally Fitness, they operated health clubs and fitness facilities over the USA under the Bally Total Fitness name. Here you can learn more about the history of the Bally corporation. Pinball Expo tour 1995 visited Lenc-Smith. 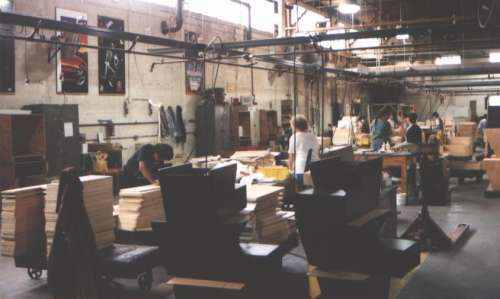 Lenc-Smith made almost all the cabinets for Williams / Bally pinball machines and Midway arcade games. What they did exactly to a playfield changed over the years. In the beginning they created the complete playfield, starting from bare wood. After the LS Topcoat experiment however they did not do any clearcoating, that was done by Sun Process. During the Pinball Expo 1995 visit at LS it was said that routed playfield came in from another company, and Lenc-Smith put in the lamp inserts and screened them. I even found information that a few years later LS even only made cabinets for pinball and video games and did not produce playfields anymore at all. Lenc-Smith did produce plastics for some games, which can be identified by the -LS extension of the part number. Williams stopped making pinball machines in 1999 and around 2000 WMS sold/auctioned Lenc-Smith. Churchill Cabinet Company is now registered at the same address where Lenc-Smith was when it was a subdivision of WMS, so it seems Lenc-Smith was also sold off to Churchill (and Churchill moved into the LS building), after having taken over Electronic Sound as well ? TAG stands for Thomas A. Grant who was the son of the Thomas Grant who founded Advertising Posters. Basically, TAG was the continuation of the company that did backglasses for pinball machines since the earliest days. TAG made and screenprinted playfields and plastics for Williams in the 1990ies. They also made the backglasses for No Good Gofers. 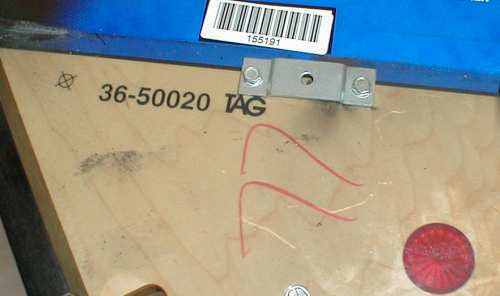 TAG was bought in 2001 by Gene Cunningham (of Illinois Pin Ball). All the assets of the company moved to IPB. Until then Stern Pinball used TAG for their playfields (up to and including a part of Austin Powers), but after this sale Stern switched to Churchill (who already delivered their cabinets) as playfield supplier. Sun Process is a screen printer. They printed and clearcoated playfields, but also made playfield plastics (therefor SP- is printed in the part number on plastics like slingshots of some games). Some information and pictures can be found in the book Pinball Art by Keith Temple. Sun Process only worked for Williams (not for other pinball companies) and had a very good relation with WMS. Ron Baum, who did the sales for Sun Process, told me the cooperation started in the early 1980ies when Williams searched for a new company to provide them with decals and playfields. The first parts SunProcess supplied to Williams were decals for the Defender arcade game. The first pinball parts were for the Space Shuttle pinball machine. They used a 4 color printing process for the backglass. Sun Process was able to deliver Williams every type of screen printed plastic part used on a pinball machines and arcade games: the backglass, translites (subcontracted to another company), cabinet decals, playfields, dmd insert panels and playfield plastics. In the early nineties when there was a lot of demand for pinball machines (ie for Addams Family and Getaway), Sun Process delivered up to 200 playfields a day to Williams ! Where to find these identification marks ? Playfields are usually marked at the front edge.. It's best to see when you lift the playfield up, but usually they can also be seen when you open the coin door. Other information about the companies involved can be found in the outlanes (Diamondplate logo), or usually at the left side underneath the apron. There usually a part number and identification is printed. My Funhouse was a regular production run. Has ESC DEC 10 and 12 21 90 SP on it. So it was routed by ESC on December 10, 1990 and screened by SP on december 21th. My World Cup Soccer: ESC JUN 15 and SP JUN 21 1994. My Twilight Zone has CCC stamped on the edge of the playfield, so probably Churchill Cabinet Company did the routing. And the screening/clearcoating of my TZ playfield was done by TAG. Also shown in this picture are the red insert under the apron and a number that can be found on many games. You probably also want to know what these are for ? The number (usually in red, sometimes in blue or black) was put there by the workers on the assembly line at Williams to keep track of the number of games they made each day. The red insert under the apron was put there for testing purposes. To test the strength of the adhesion of clearcoat on the playfields, some playfields of a run were scratched over the inserts. First this test was done on playfield inserts. Because this ruined the playfield, it was more cost-effective to add an extra insert to every playfield in an invisible place. That way playfields used for testing could still be installed in games. My games are all regular production run machines. From what is documented it seems that for prototype/sample games, a different company was sometimes used. See this Earthshaker page at billyseven.net for information about the Eartshaker Prototype: it had a Diamondplate playfield with special label and a blue screened cabinet. Does it matter what company did what to your playfield ? Yes. It seems there are small differences in quality. This post by John Wart Jr. to rec.games.pinball explains a lot about the differences on Bram Stokers Dracula, Funhouse and Creature of the Black Lagoon. Having playfields made by different companies explains why where is a 'hot pink' and a regular version of the CFTBL playfield: different manufacturers use a slightly different paint, or the paint reacted different to the clearcoat. I also noticed the quality difference. It seems my Whitewater playfield was made by Lenc-Smith (see LS printed on the left). This playfield, and some others that I have seen also have small cracks. TAG has also created/printed Whitewater playfields and those don't have this issue. My Whitewater playfield. Seems to be screened by Lenc-Smith but it has the diamondplate logo so it was sent to Sun Process for diamondplating ? Although from the examples above you may get the impression that playfields were always sent to different companies, this is not always true. On my Jokerz and Cirqus Voltaire playfield I can only find a CCC date stamp, so Churchill could deliver finished playfields too (as it did in the 1980ies already for Williams and still does for Stern). I have a Getaway playfield with only ESC on it (ESC also made playfields for Gottlieb). I have a Demolition Man playfield that has a stamp from ESC, SP, and an additional WMS serial number stamp. This Monster Bash playfield has 'BURKEL' stamped in it. Burkel was the supplier of the timber used to make the playfield. If you look at older playfields and other brands, it becomes more confusing. My Black Hole main playfield has ESEP stamped in it (although the E looks different from the rest of the letters) but was probably made by Electronic Sound, while the smaller lower playfield only has AC on it ? My Bram Stokers Dracula playfield (made by Lenc-Smith) has a number imprinted in the center. It's difficult to see but it's there..
HPMA on a Data East Tales from the Crypt playfield. Lenc Smith and HPMA on a prototype NGG. It seems Data East playfields have HPMA and a number on them. This has been seen on a Tommy and a Tales from the crypt playfield. If you find other stamps on a playfield, please email me..
Diamond Plate is a hardcoat for pinball playfields that was developed in the mid 1980ies by Sun Process. Ken Fedesna, Vice President at Williams asked Sun Process to research if pinball playfields could be made more dureable. Their answer was Diamond Plate. This was based on Imron, an automotive 2-component urethane hardcoat developed by DuPont. There were minor changes to its formula and application (thickness, drying time, ..) so it could be applied to the wood of playfields. Banzai Run playfield with experimental XR-7 coating (which later became DiamondPlate). Diamondplate was maybe too good. It is said that one of the reasons why demand for pinball decreased in the late 1990ies was that operators did not need to buy new pinball machines as fast as they did before. In the past an operator was almost forced to buy a new pinball machine when it had too much playfield wear (players want games that look like new, not worn out). Diamondplate added several years to the commercial lifespan of pinball machines, taking away a bit of the need for operators to buy new games. 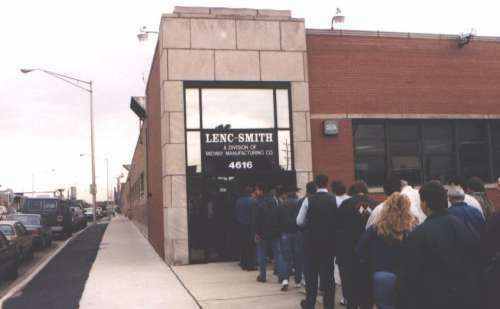 Lenc-Smith made their own version of clearcoat and named it L.S. Topcoat. For instance some Funhouse proto / sample games have been made with this topcoat. It was also used on some Bugs Bunny Birthday Ball and Harley Davidson machines. However LS Topcoat was found to be not as dureable as Diamondplate. Therefor it was never used for production games. A few Banzai Run and Earthshaker machines (usually prototype games) were produced with the XR-7 topcoat, the code-name for DiamondPlate. From then on most games that were developed, also had DiamondPlate on the prototype machines. This is indicated on the playfield. The first game that had Diamond Plate on its non-prototype games was Bride of Pinbot. As the some colors (purple / red) were affected by it, this was not applied on the whole run. Since then there were some small changes to the formula, and by the time Getaway was in production it was perfected. Terminator 2 was the first game to have DP on all of its playfields. These games all have the DP logo somewhere near the right outlane. Diamondplating a trademark of Sun Process. So if a playfield has the DP diamond logo on it, the final clearcoat was done by the Sun Process company. Some replacement Diner playfields were made with Diamond Plate, and were labelled as such in the LEFT outlane. These playfields (or prototype Diner games with a DP playfield already in) are quite rare. 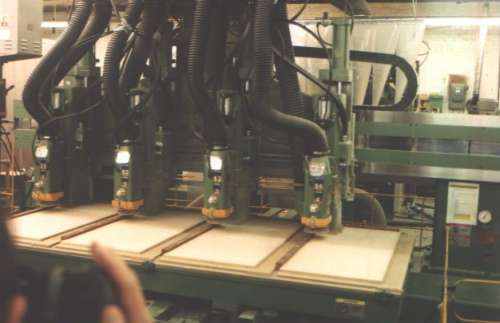 As Lenc-Smith would not clearcoat playfields, later in the 1990ies they also did not screen print them anymore and only focused on cabinets. Most WPC playfields were screenprinted and hardcoated by Sun Process (see above, like my Road Show and World Cup Soccer). Even in the early nineties when LS screened playfields, they were sent to Sun Process for diamondplating (like my Whitewater). TAG also clearcoated playfields, these do not have a Diamondplate logo (like my Twilight Zone). After a few years (around 1994) Williams dropped the DiamondPlate logo from all playfields. They could still be made / clearcoated by Sun Process, but as competitors also had a hardcoat on their playfields, there wasn't a marketing advantage anymore by labelling a clearcoated playfield as such. Shortly after the introduction of Diamondplate by Williams, most other pinball companies (Data East and Capcom) also started to clearcoat their playfields. Data East named their clearcoat 'Stealth Coat' (or Stealth Hardcoat) and started to apply this as of their Star Trek 25th Anniversary pinball machine. Gottlieb (or Electronic Sound as they made the playfields) never made the switch and continued to still use lacquer. Gottlieb however did experiment around 1988 with something completely different that they called Vitrigraph. 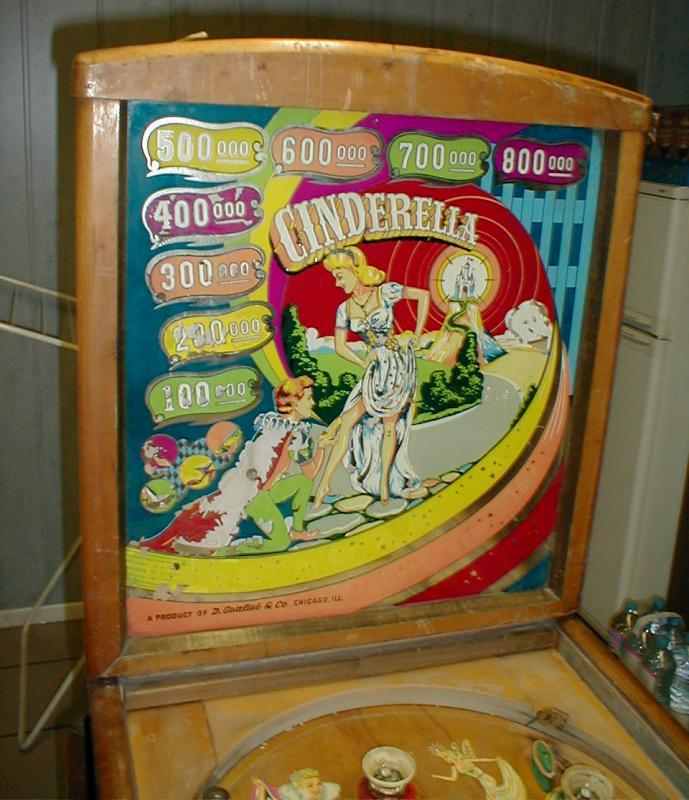 Used only on the games Victory and Diamond Lady, the artwork was printed onto the mylar sheet that was applied to the playfield, instead of being screened to the wood itself. The flyer from Williams in 1989 to announce Diamond Plate to operators. 'You'll never scratch the surface of amazing Diamond Plate'. The pictures show a Diamondplated Banzai Run playfield, played non-stop for 2 years without any signs of wear, and a Rollergames playfield. 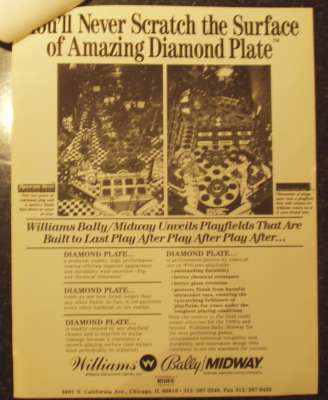 Attached to this flyer (it was supplied with a new pinball game) came a letter (dated October 20, 1989) stating that Williams had stopped shipping games with full playfield mylar installed, because of adhesion problems. A playfield mylar was still provided but it was left to the operator to install it or not. The installation instructions warn for the danger of using a petroleum-based cleaning products. This also explains why on games like Funhouse some machines have mylar and others don't: it was up to the operator to install it, while on previous games (before October 1989) games had mylar pre-installed from the factory. There are currently a few companies that make reproductions of pinball playfields. These are ideal when you want to restore your used pinball machine in mint condition. Classic Playfields (classicplayfields.com) like their name says, makes reproduction playfields and plastic sets for 'classic' pinball machines. They also have a pre-order list where you can register and vote what new projects they should work on next. Illinois Pin Ball (illinoispinball.com) produced reproduction playfields for pinball games like Kiss and The Addams Family. High Class Pinballs (highclasspinballs.com) has recreated playfields for Attack from Mars and Whitewater. They also sell a lot of other parts to pimp your pinball machine. Below is a video of inserts being glued into a Whitewater playfield using a robot. Continue to part 2 in this article about pinball cabinet manufacturing.